I’m a little behind schedule as we begin to bring more written content back into the Half Ashed equation. This particular item from J. Grotto came through this past week…. 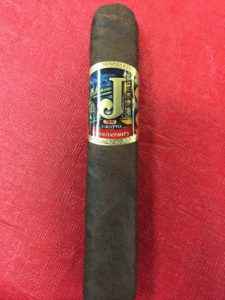 Ocean State Cigars has launched an addition to their J. Grotto Anniversary cigar line. The extension is a 5.5″ x 54 double robusto, which comes pressed and adorned with a maduro wrapper. The Anniversary line is being manufactured by Phil Zanghi at the De Los Reyes/Debonaire factory in Tamboril, Dominican Republic. Aside from the factory, the Reyes family of tobacco producers lay claim to supplying the majority of tobacco used by Dominican cigar manufacturers. Proprietor Paul Joyal is a bit secretive about the blend specifics, noting only that it is “Dominican and other Central American tobaccos.” I recently had the opportunity to visit and sit down with Zanghi, and have to admit I was more than a little impressed with the factory’s efficiency, cleanliness and “family” work environment. Like previous Anniversary vitolas, the Double Robusto is described as medium-bodied, which is a departure from other J. Grotto cigars, which the company markets as medium-full to full-bodied. Each Spanish cedar box holds 10 cigars and bears artwork reflecting the special nature of the Anniversary line. The line’s original 2014 debut marked a year of special wedding anniversaries for the Joyal family … his parents’ 65th and his 30th. Gold coins in the art also bear the initials of immediate family members. Joyal describes what he thinks is Anniversary’s most appealing feature: “super premium quality and performance at a consumer-friendly price … $8.50.” Like all other J. Grotto cigars, the Anniversary Double Robusto is available only to brick-and-mortar tobacco shops … not Internet and mail-order discounters. The 2014 limited edition Tatuaje TAA exclusive. This particular run was a 6” x 52 vitola, wrapped with Connecticut Broadleaf. The internal components are all Nicaraguan, and it was produced at My Father. About 56,000 of the cigars were produced, and they retailed at the time for about $11US. A couple of petitions have been posted. Turnout has thus far been lackluster with fewer than 13k of the required 100,000 signatures posted as of this afternoon on the primary one. For all the bluster, I fear the industry is too splintered and complacent to mount an effective grassroots movement. I see a lot of social media jockeying by consumers, a good bit of energy from the small, “boutique” companies, and even some action from bigger companies (very little, for the most part)…but the low number of signatures on the petition and reports of overwhelming ignorance at the real-world consumer level have caused me some degree of trepidation. I fear the years of it being “someone else’s job” to inform everyone are coming home to roost; if the consumer base is largely unexposed to social media – and social media has been the default mode of communication – it’s no surprise that the average Joe cigar smoker in the shop doesn’t even know about the recent FDA changes. Unless the masses can somehow come down off the Facebook soapbox and spread the word in their local shop, this whole fiasco is destined to solidify in its present state. It takes fewer than 60 seconds to fill out this petition. There are an estimated 3,000,000 cigar smokers in the U.S., and fewer than 13,000 have signed in 10 days. Do that math. If people can’t rally now, when? Nicholas Melillo’s Foundation Cigars has put out a new line – called The Upsetters. Interestingly, it features some Jamaican tobacco in the filler blend. The line will have eight vitolas, The 5”x 54 Django, 4.5” x 40 Small Ax, the 4.5” x 38 x 54 Skipper, 7” x 48 Rock Steady, and 4” x 32 SKA all feature a claro wrapper. The 6” x 60 Original Rude Boy and 6” x 52 ZOLA use a maduro wrapper, and the 4.5” x 38 x 54 Para El Sapo uses a candela wrapper. The factory has not been disclosed, but it will be manufactured in Estelí. Melillo says he wants to bring Jamaican tobacco back into prominence. 98 Montecristo Especial – A friend asked if I could help out with a special cigar from the birth year of his newly graduated cousin and I was happy to oblige. I cracked the first of my boxes and was met with some white, pillowy mold. Not much but enough to remove the culprit sticks and put them to the top of my “Smoke Now” stash. They’re smoking like cigars in transition; not without flavor, rather swaying between the two profiles these cigars tend to embody. The light was tart & fruity and the first third progressed towards savory cocoa & creamy coffee. Excellent sticks that are always some of my favorites. These are not the best I’ve had but are perfectly constructed, very flavorful and really only suffered from the mold visually. My second box was clean and I passed along 2 sticks for them to enjoy. PrimerAño from Chogui…I still like the Dos77 better. Much, much better. Not much…fought off a headcold this past week. 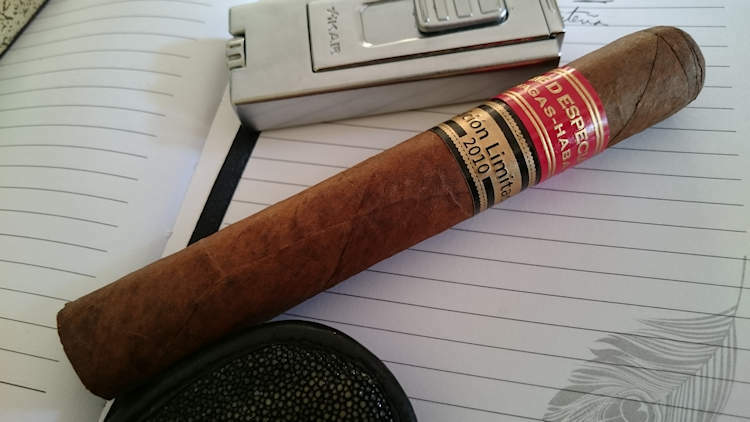 Unbanded 027 – A 5”x50 robusto with a dark wrapper and smooth but dry complexion. There’s a faint aroma on both wrapper and foot…not much else is known. Let’s see how it goes, shall we? The FDA has spoken. Now what? Keeping with the themed framework of the revamped Camacho brand, they announced the upcoming launch of a new line called the Powerband Series. Aside from the motorcycle them, what piqued my interest is their new bunching process – reportedly combining an accordion style bunching process and traditional entubado bunching. They’ve dubbed the process the Powerband bunching method. I can’t say that – even with the refacing over the past couple years – I’ve had a great deal of interest in the Camacho recently. That being said, I’m intrigued by this. They believe the new process “maximizes airflow for peak performance.” As for the cigar, it contains an Habano 2000 wrapper over San Andres Negrito binder and five different filler tobaccos (Nicaragua, Honduras, & the Dominican Republic). It will come in Robusto (5”x50), Toro (6”x50), and Gordo (6”x60), and range from $11-13 at retail. La Escogida (Sp?) – Gifted from Zedman. A sweet, slightly savory stick (2 vitolas!) which were cool, perfectly flavorful and wonderfully tilted towards the sugary sweet profiles I adore. A must for me to have again. I smoked my two sticks two days in a row! My Father Limited Edition 2010 – I broke my box. I finally smoked the innagural LE from Pepin & Jaime. I knew exactly what I’d get and it didn’t surprise me. Anybody want to buy a box of nine 2010 LEs? Next episode (145), we will be smoking the Tatuaje TAA LE 2014. So come by Friday night and hang out with us in the chatroom during the show. If you would like to contact us in the meantime, you can reach us via the Contact Page or the following emails: [email protected] or [email protected] Please feel free to drop us a line if you have any questions you’d like answered, comments to make…or even compliments and complaints. We love to get your emails! Also, remember you can always go back and listen to previous episodes, which can be found in the Half Ashed Archive. You can download this week’s audio directly below (right-click “Download” and save), find us on iTunes, or subscribe with any podcast app at our RSS Feed. Video, as always, will be available at the Half Ashed YouTube Channel. From Craig: This stunning Hermoso #4 is a sight to behold. It’s Ecuadorian colorado maduro wrapper sits over all Nicaraguan innards. The first cigar from the Robaina family released outside of cuba, this cigar was originally released and made in a partnership with Cubanacan. 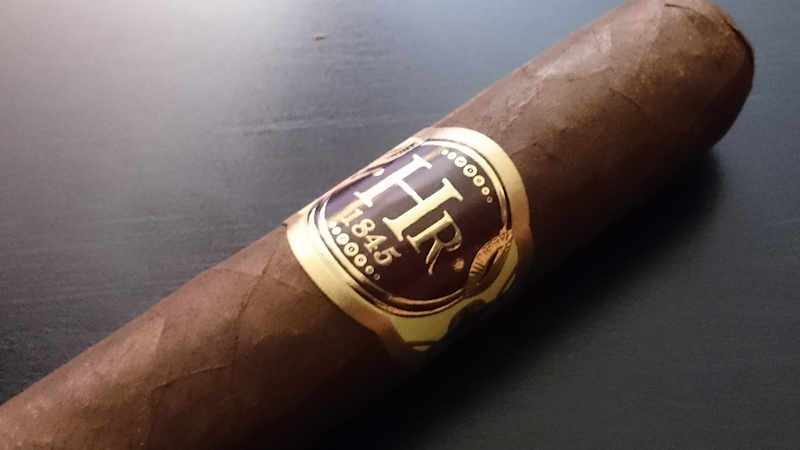 Throughout the much covered turmoil that emerged prior to IPCPR 2015 the HR line of cigars was in limbo. The public wasn’t aware of whether the cigar would continue to be made. Questions about its ownership, manufacture & distribution all existed. Thankfully, just this past month the last of the questions was answered and the HR cigars will continue to be manufactured at their original factory, and will still be owned by Hirochi Robaina. 262 Cigars launched a campaign dubbed “The Internship” to allow consumers to select a 2017 line. It’s an interesting approach, and the cynic in me thinks it’s probably not a bad way to market some cigars :). They will sell 5-packs of four different blends over this year, with buyers having the ability to take notes and rate them online…the winning blend will become a full-production offering in 2017. The four test blends will be: The Search, The Resume, The Interview, and The Offer. The Search is already available at 262cigars.com, and is available in a corona, robusto and toro. We mentioned this a couple months ago, but haven’t talked much more about La Galera from Jochy Blanco/Tabacalera Palma. I’ve had the chance to smoke a few of them recently, and found them rather enjoyable. The Habano version (Ec Habano over DR corojo binder & DR piloto Cubano//DR criollo ‘98//DR pelo oro filler) comes in a number of sizes (5”x50, 6”x54, 6.5”x52, and 6.25”x60) and retails for $7-8. The Connecticut version (EC CT wrapper over same internal blend), comes in 5.125”x50, 6”x54, 6.125”x52, 5.25”x60, and 7.25”x50 and retails slightly lower, ranging from about $5-6. There are a couple other sizes available in the European market (and the DR…I’ve been digging the lancero myself). I wouldn’t hesitate to personally recommend giving these a try. They’re a very good deal at the pricepoint. I tend to prefer the habano-wrapped version, but both and worth investigating. The PrimerAño from Chogüí came in went here in the DR…and I missed the boat. Almost. Next episode (139), we will be smoking Unbanded #026, from Kevin Hasselwander. So come by Friday night and hang out with us in the chatroom during the show. If you would like to contact us in the meantime, you can reach us via the Contact Page or the following emails: [email protected] or [email protected] Please feel free to drop us a line if you have any questions you’d like answered, comments to make…or even compliments and complaints. We love to get your emails! Also, remember you can always go back and listen to previous episodes, which can be found in the Half Ashed Archive. You can download this week’s audio directly below (right-click “Download” and save), find us on iTunes, or subscribe with any podcast app at our RSS Feed. Video, as always, will be available at the Half Ashed YouTube Channel. 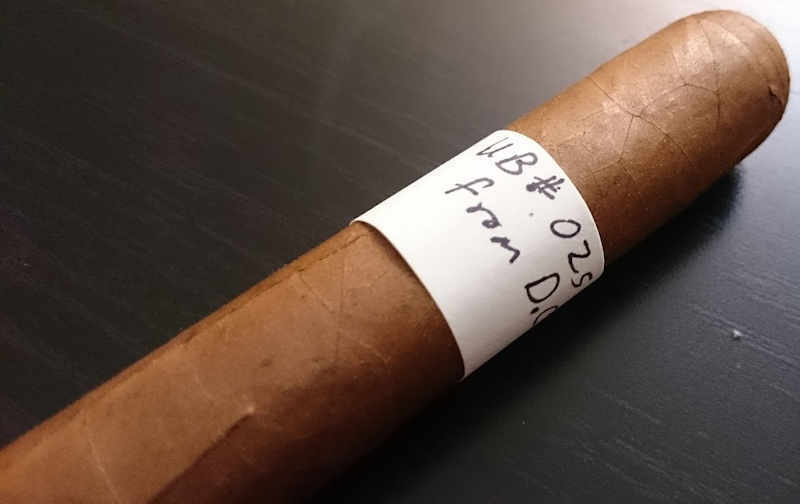 Unbanded 025, from Dan C.
Kip’s preliminary observations: Unbanded #025 is a pretty straightforward 5” x 50ish (5”x52 for Craig) robusto. Construction appears spot-on for both examples; wrapper has a slight sheen and moderate-heavy veining. Somewhat sweet aroma at the foot, akin to a hay stall but with a bit of molasses if I focus enough. Milder aroma on the wrapper. Absolutely perfect cap build and, subsequently, draw. The draw has a very slight earthy nature, but overall is sweet and grainy. Tune in to find out how it went….and thanks, DC! Robert Caldwell, of Caldwell Cigars, has publicly confirmed a planned maduro version of the Eastern Standard. The line will feature four vitolas (Corona (5 3/4 x 44), Piramide (6 x 49), Rothchilde (4 3/4 x 49) and Toro Gordo (6 x 50), and run somewhere near the price of the existing line, but possibly with a slight increase. The Eastern Standard can be found in the real world between $8-12 depending on size. Omar de Frias has announced via social media and press release that Fratello will be releasing a limited edition sampler, the Boxer Series. The sampler will include the Boxer, a 6 1/4 x 52 belicoso, the Boxeador (6 x 54), Boxero (5 1/2 x 50), Boxista (5 x 48) and Boxerito (4 3/4 x 46). The blend will be the same as the original line (Nica Habano over Ec. Sumatra and Nica/Peru filler), but will be box pressed. Three thousand of the samplers will be produced, and should retail around $45…and the packaging itself is noteworthy. The box looks like a small cigar mold. I personally thought it was pretty creative and nicely done. I like it…. The game is afoot, legislatively. Since our last episode, we have learned that a.) the FDA has submitted its proposed plan to regulate premium cigars (and other tobacco products) to the Office of Management & Budget (OMB), and b.) eleven Democratic senators have urged the OMB to complete the review as quickly as possible. The OMB measures the feasibility of these types of proposals, and is expected to recommend action on it after review. As an executive agency, congressional approval or vote is not necessary for the FDA to implement new regulation – just OMB approval. What is NOT known are the exact contents of the FDA’s plan. A couple of options were thrown around in their earlier “Deeming document,” but as of yet the finalized, formalized plan has not been revealed outside government circles. As always, the aforementioned urging senators are pushing this expediency that rarely exists elsewhere in US government to prevent tobacco use by our youth. Possibilities are myriad; this is what we’ve been talking, writing letters, emailing, and calling politicians about for the past 3 years+. If you’ve not done any of those things shame. On. You. Senate bill 441, which would call for an exemption for premium cigars, has the support of 18 senators at the moment…. Following similar releases for the Davidoff and AVO segments, Oettinger Davidoff is preparing to release a Griffin’s Nicaragua. It will feature a Nicaraguan habano wrapper over Dominican piloto cubano binder and five filler tobaccos from Honduras, the Dominican Republic, and Nicaragua. Epicurean Sues H.O.E. : In a move that further exemplifies the turmoil that the House of Emilio distribution giant has been experiencing in 2015, one of its original brand owners is suing the group over alleged lost/withheld income. The sum is a modest one, over 150k, but certainly represents a sizeable amount of cigars when considering the reported purchase price of 27% below wholesale that Halfwheel is reporting. That, if all attributed to purchased cigars, computes to a bit under 50k cigars. Yikes. 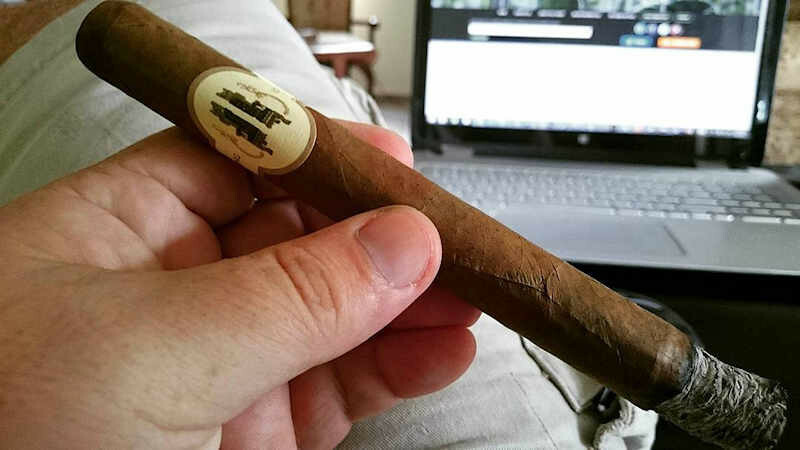 Padron Damaso: Don’t listen to the negative press on this cigar. It tastes like a Padron. It tastes like a connecticut leaf. It’s good and it’s worth trying. In the next episode (130), we will be smoking the EP Carrillo Short Run 2015. So come by Friday night and hang out with us in the chatroom during the show. If you would like to contact us in the meantime, you can reach us via the Contact Page or the following emails: [email protected] or [email protected] Please feel free to drop us a line if you have any questions you’d like answered, comments to make…or even compliments and complaints. We love to get your emails! Also, remember you can always go back and listen to previous episodes, which can be found in the Half Ashed Archive. You can download this week’s audio directly below (right-click “Download” and save), find us on iTunes, or subscribe with any podcast app at our RSS Feed. Video, as always, will be available at the Half Ashed YouTube Channel. The L’Atelier Cote d’Or debuted in April ‘15, as a special limited release. 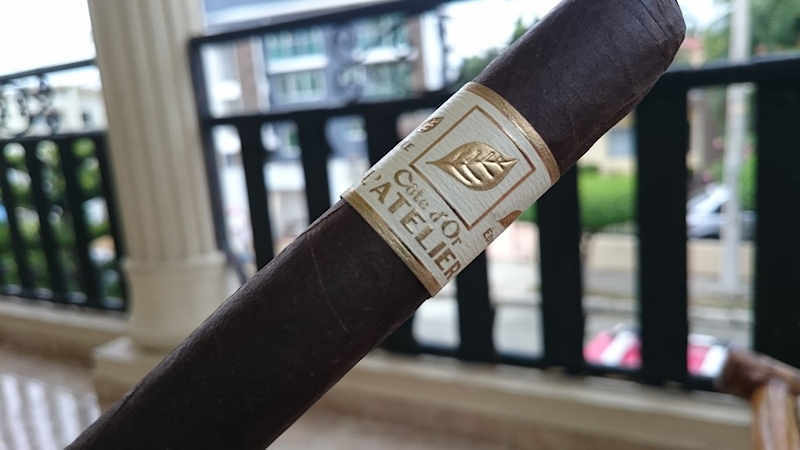 It was produced by My Father for the company, and features a small amount of Pelo de Oro, an Ecuadoran Sancti Spiritus wrapper, and an all-Nicaraguan binder/filler combination. Total production for the cigar was limited to about 21,000 cigars, packaged in boxes of ten and retailed for about $16 per stick. It measures 7”x47. In celebration of Carlos Fuente Sr.’s 80th birthday, Fuente is releasing the famed “Senior Blend” Don Carlos to the public. Previously, it was hard to come by outside of a few events or from a family members’ hand. It is a tweaked version of the regular production Don Carlos blend, and will be available in two vitolas – a 5×50 robusto ($14) and the “Eye of the Shark,” a box pressed belicoso measuring 5.75” x 52 ($11.95). The robusto is all Dominican internally, with a Cameroon wrapper – while the blend details for the Eye of the Shark have not been revealed. Cigar Aficionado has mistakenly reported that this is the 30th anniversary of the Don Carlos line….however, the series came out in 1976 and celebrated with the 30th Anniversary blend in 2006…. Hammer & Sickle, a cigar line with which I’m only vaguely familiar, is releasing a special “Peat-fired” cigar called the Caleanoch 25. I understand some of the leaf is fire cured like others we’ve seen in the past – with one change. Rather than various hardwoods being used, peat will be burned during the curing process. It will feature an Ecuadoran CT wrapper over Dominican corojo binder and Dominican fillers. Initially, the 25 will have about 25% peat-fired leaf in the filler blend – but, subsequent releases will have 50 and 75%, and be renamed respectively. It will be available in a single 6”x50 vitola and retailer for $12.50. Cubanacan Eastern Sales Manager and friend of Half Ashed Nate McIntyre is launching his own line of cigars, called Percy Ray Cigars. It will be a limited annual release, produced by Cubanacan in their Nicaraguan factory, with the first release coming in a batch of about 800 boxes. The name of the line is a tribute to McIntyre’s grandfather, to whom Nate attributes his work ethic and values. Chogui, a line currently only available in the DR, is coming to the US. I had the chance to sit down at a Santiago cigar shop with Victor Nicolas last week, and he tells me he’ll soon be shipping several thousand cigars to the states. They will be from his second offering, Dos77 (which has an interesting backstory for that name), and were rolled in August 2014. I am trying to catch up with him at the factory this upcoming week when he returns to Santiago and check out his next project….I have to tell you, though, the Dos77 is probably the most refreshing new cigar I’ve had since moving to the DR.
Southern Draw Kudzu – AJ Fernandez through and through. Nicaragua sweet spice. Dusty & full bodied. Strength was there but not overpowering. The palate pollution was a bit high but trading swigs of water and puffs kept it at bay. Very very enjoyable if you like the style. Arturo Fuente Destino al Siglo – Lots here. Not all of it is good. In the next episode (128), we will be smoking one of Craig’s selections, the Room101 Serie SA. So come by Friday night and hang out with us in the chatroom during the show. If you would like to contact us in the meantime, you can reach us via the Contact Page or the following emails: [email protected] or [email protected] Please feel free to drop us a line if you have any questions you’d like answered, comments to make…or even compliments and complaints. We love to get your emails! Also, remember you can always go back and listen to previous episodes, which can be found in the Half Ashed Archive. You can download this week’s audio directly below (right-click “Download” and save), find us on iTunes, or subscribe with any podcast app at our RSS Feed. Video, as always, will be available at the Half Ashed YouTube Channel. Boxcode: NISV – December of 1993 these little cigars were boxed and headed out of the factory. They’re a “Carolinas” vitola, coming in at an odd 26×4-¾”. This box has been open for a couple of years but the unique “Punch” flavors have morphed more into a basic “Vintage” tobacco flavor. The nuance is gone but the suave character is certainly there in spades. We’ll be smoking a new(er) punch coming up in near future and it’ll be interesting to see if Kip can spot any of the hallmark flavors in that which he detects in this more mature stick. I went through a phase where small sticks were what I always reached for first. They fit the bill whether short on time or looking for variety. It’s not too uncommon to be able to finish 2 of these in an hour. 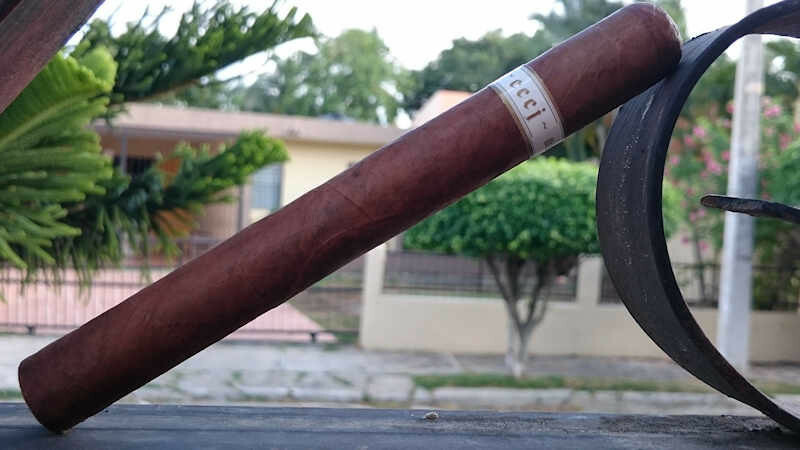 Fresh on the heels of our smoking the Crowned Heads’ Jericho Hill OBS last week, we now know that they will be releasing a lancero in the line. The “12 Honest Men” will be a 7.5” x 38 with similar blend to the remainder of the line (Mexican San Andres over Nicaraguan binder & filler). It is, at least initially, limited to 3,500 boxes of 12 (42k total production) and will retail for about $10. It should begin shipping within the next few weeks. Continuing with the Crowned Heads theme, they have released some information about one of next year’s new introductions: Las Mareas (the tides). It will be available in four vitolas (6 1/8 x 46, 4 1/2 x 48, 5 1/2 x 52 and 6 x 54). The company is shipping one box of each size to seven selected retailers this week, but regular production will not be available until next Summer. Freyja, Jose Blanco’s wife Emma Viktorrson’s creation, has begun shipping. It has been available in parts of Europe for several weeks, but is just now reaching U.S. shores. Emma has been forthright in saying that this is entirely her project with no blending input from neither Jose nor Jochy Blanco. It has a Dominican Criollo ‘98 wrapper over Mexican San Andres binder and fillers of DR Criollo ‘98, Dominican Piloto Cubano, and Estelian tobacco. It is being produced in four sizes (5.75” x 42, 5.5” x 50, 6”x54, and a 6.5”x 52 figurado), and retailer from $7-10. The theme is built around Emma’s native Swedish heritage and mythology – notably, the goddess Freyja, queen of the Valkyries. Halfwheel is reporting some legislative news from El Cerrito, CA that should catch all our attention. The city has passed some stringent new tobacco regulations, which ranges from designating where tobacco sellers can operate (within certain distances from schools and other retailers). It bans outright the sale of flavored tobacco products, and the sale of single cigars under the $5 mark. No new licenses will be granted to establishments that receive more than 50% of revenues, nor those that allot more than 20% of retail space, to tobacco products. The new license will also cost retailers more than $400 per year to retain. In the next episode (127), we will be smoking one of Kip’s selections, the L’Atelier Cote d’Or. So come by Friday night and hang out with us in the chatroom during the show. If you would like to contact us in the meantime, you can reach us via the Contact Page or the following emails: [email protected] or [email protected] Please feel free to drop us a line if you have any questions you’d like answered, comments to make…or even compliments and complaints. We love to get your emails! Also, remember you can always go back and listen to previous episodes, which can be found in the Half Ashed Archive. You can download this week’s audio directly below (right-click “Download” and save), find us on iTunes, or subscribe with any podcast app at our RSS Feed. Video, as always, will be available at the Half Ashed YouTube Channel. This week, in Craig’s absence, Kip is joined by special guest host William “Cigar Coop” Cooper. Tune in as Kip has the chance to pick Coop’s brain about the current state of the cigar industry and some recently introduced cigars. We have lots of great conversation in store, so this is one you don’t want to miss! In episode 122, I pontificated a bit about the status and future of House of Emilio. Now, just a couple weeks later, yet another member (Guayacan) has left the fold….. How does Guayacan differ from the other brands that have dropped from the fold? What is going on with House of Emilio itself? Tune in for some lively discussion on this…. Earlier this week, Boutique Blends announced the promotion of Charlie Lopez to their Director of Sales. Congratulations to Charlie…and more on why this is a big step for the company. Steve Saka’s Update on Sobremesa – 1) The 6 x 52 Belicoso Largo was replaced by the 6 x 54 Torpedo Tiempo; 2) Orders expected to ship on November 1st but because of overwhelming demand they will not be able to ship the full orders to retailers. Instead each retailer will receive an “equitable share” of the first order and the remainder will be filled as soon as possible. Saka says he wil not deviate from his production plans of 1,000 boxes per month. I continue to be concerned with the increasingly frequent news items I see go through my feed about new legislative attacks on smoking. The stories have moved from the larger municipalities into small town America. None of this *surprises* me; I just hate to see the attacks intensify. Quite a number of new ban proposals, ranging from parks & government property to private businesses and even residences (multi-family) seem to hit the legislative floor every week. We offer more indepth analysis of the situation and how much of the news being reported by other outlets do not apply to cigar smokers. While I get it infringes on our civil liberties, I think it takes the focus off the real problem at hand with FDA control. Drew Estate is releasing an exclusive extension to the KFC lineup for Alliance Cigar. I’m frankly not sure why. While I was initially intrigued by the KFC launch, I couldn’t handle the heavy handed fire cured content. Subsequently, after trying most all of the available vitolas, I don’t find much variation throughout the lineup. I’m not sure another vitola (this time 5.5”x52) will do the trick. In the next episode (125), Kip will be rejoined by Craig for regularly scheduled programming. So come by Friday night and hang out with us in the chatroom during the show. If you would like to contact us in the meantime, you can reach us via theContact Page or the following emails: [email protected] [email protected] Please feel free to drop us a line if you have any questions you’d like answered, comments to make…or even compliments and complaints. We love to get your emails! Also, remember you can always go back and listen to previous episodes, which can be found in the Half Ashed Archive. You can download this week’s audio directly below (right-click “Download” and save), find us on iTunes, or subscribe with any podcast app at our RSS Feed. Video, as always, will be available at the Half Ashed YouTube Channel. 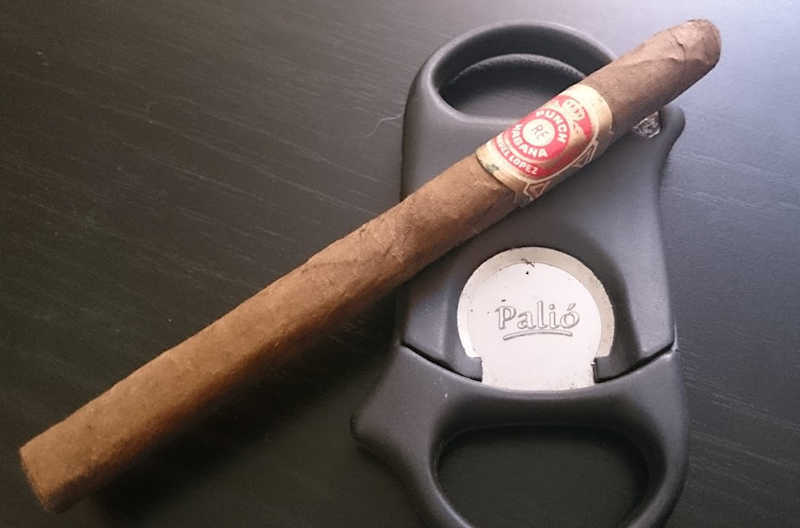 One of the 2010 Edicion Limitada releases from Habanos, the Partagas Serie D Especial is a take on the traditional PSD4, but with ⅝” more in length and a further processed maduro wrapper. It is a Gordito vitola, typically referred to as a Toro (5-½”x50). Its rustic, thick maduro wrapper does not impart a large amount of typical maduro flavors to the mix but certainly does help round out the typical PSD4 profile with a bit more complexity. Tobacconist University, in partnership with the producer J. Fuego, has shipped the second round of the R&D Series. This batch is being released with a total production of 4,000 Churchills, and 8,000 each of the Robusto and Toro. To go with the cigars, packets of puritos are available for additional purchase (2,000 packs of these). The puritos are comprised of each of the 5 tobaccos involved in the blend: PA Connecticut wrapper, Honduran (Jamastran) habano (binder), and fillers from Nicaraguan (Ometepe) habano criollo 98, NIcaraguan (Estelí) habano criollo 98, and Nicaraguan (Jalapa) habano corojo 99. For about $17-18 you can pick up one of the blended cigars and a packet of the small (~4”x26) puritos. They are available at selected Tobacconist University Certified retailers. The proposed 40% tax on cigars has reared its head again in Pennsylvania. After being defeated in budget approval earlier this year, governor Tom Wolf’s idea has been resurrected by state democrats in the form of SB13. 01 La Gloria Cubana Tainos – Woof! In the next episode (124), Kip will be joined by none other than Will “Cigar Coop” Cooper. So come by Friday night and hang out with us in the chatroom during the show. If you would like to contact us in the meantime, you can reach us via the Contact Page or the following emails: [email protected] or [email protected] Please feel free to drop us a line if you have any questions you’d like answered, comments to make…or even compliments and complaints. We love to get your emails! Also, remember you can always go back and listen to previous episodes, which can be found in the Half Ashed Archive. You can download this week’s audio directly below (right-click “Download” and save), find us on iTunes, or subscribe with any podcast app at our RSS Feed. Video, as always, will be available at the Half Ashed YouTube Channel. In a story that has me conflicted as to whether it’s marketing schpiel or educational tool, La Aurora is releasing a “Training Kit.” It will include a couple marketing items – branded lighter, cutter etc. However, it will also have several puritos to showcase specific tobaccos (one seco, one viso and two ligero). The kit will also include a larger vitola that has a number of wrappers across its length (a la Jose Blanco’s seminar cigar), including bare, EC CT, EC Cameroon, EC Sumatran, Brazilian Ariparaca, US Broadleaf and DR corojo. Also included are instructions & DVD…the kit promises to provide for a tasting seminar without a rep onsite. No pricing or availability details. I caught a stray tweet from the Charlie Minato that a new trademark had been filed by BOTL, LLC on the Palio cutter. Who knew? They’re still around…. Still mulling over IPCPR stuff…and in light of the 2015 departure of Nate McIntyre and Gary Griffith, I wonder how House of Emilio is doing. From all appearances, at least 4 of the previous 9 companies represented have fallen away from the fold. In fact, I understand none of the 4 had a real presence at the show (Rodrigo, Epicurean, Bodega and Herederos de Robaina). Post-Gary, owner Scott Zucca is stepping forth in a more prominent role. I’ve never met him, nor even heard the name really, until Gary left. I suppose I can say the same of new Brand Manager Spencer McGuire. I wish them the best, as I truly enjoy a great number of their offerings; I just wonder what the future holds. This will be a tough story for me to follow now that I’m outside the US. I won’t have my close tabs on a large number of American shops. The latest installment of Alec Bradley’s Fine & Rare has been announced. Once again, it will contain 10 different tobaccos. Total production is set at 2,000 boxes of ten. This time around it’s a 6.5”x56; I wasn’t able to get pricing info, but last year ran about $18/stick. This is one of few AB cigars I enjoy, but once they got up past the $14-ish mark I’ve pretty much fallen away from them. It’s interesting every year, and I’ve been quite impressed with their ability to format such a cigar with so many types of leaf. I’m anxious to see if they do that $475 kit with all the blend components in puritos. My formerly local shop had a couple and I’m not sure they ever got rid of ‘em…. In the next episode (123), we will be smoking the one of Craig’s offerings, a Montecristo #2. So come by Friday night and hang out with us in the chatroom during the show. If you would like to contact us in the meantime, you can reach us via the Contact Page or the following emails: [email protected] or [email protected] Please feel free to drop us a line if you have any questions you’d like answered, comments to make…or even compliments and complaints. We love to get your emails! Also, remember you can always go back and listen to previous episodes, which can be found in the Half Ashed Archive. You can download this week’s audio directly below (right-click “Download” and save), find us on iTunes, or subscribe with any podcast app at our RSS Feed. Video, as always, will be available at the Half Ashed YouTube Channel.